I love sushi, but I’m interested in finding what else I can do with seaweed in the kitchen. Later, at home, I looked through my cookbooks for seaweed recipes. The only European recipe book that mentioned seaweed was Welsh Traditional Recipes, by Annette Yates (Hermes House, 2008). Turns out my Welsh ancestors would have eaten a lot of seaweed. According to the Welsh recipe book, laverbread (seaweed mush) is an essential part of a traditional Welsh breakfast. My father, Ralph, was proud of his Welsh ancestry and was also very interested in food, but I never heard about laverbread from him. I think it must have been one of those “old fashioned” foods that were abandoned when my family clambered into the middle class. I suspect my mother’s Swedish ancestors would have also eaten seaweed, but there’s nothing about it in the Swedish recipe books. Seaweed is incredibly nutritious. 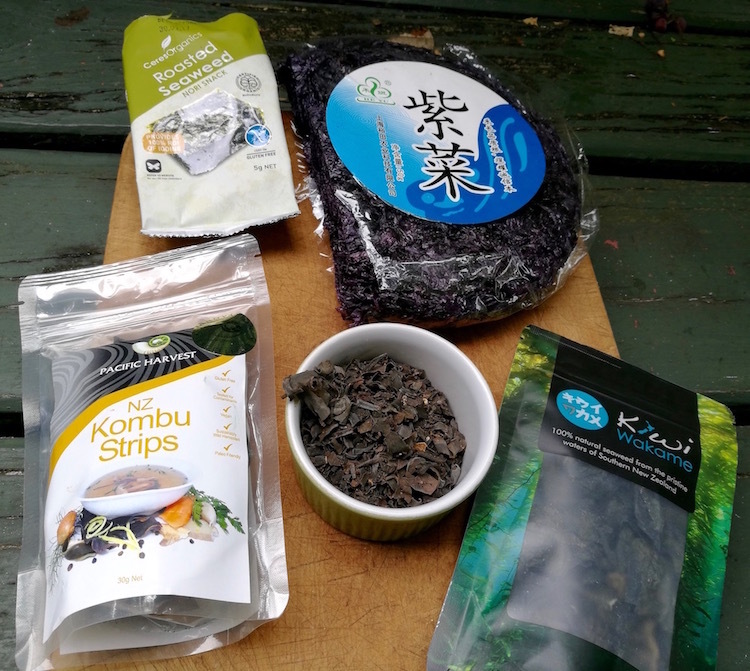 Australian scientist and entrepreneur Pia Winberg said in a recent interview on National Radio that seaweed contains all the minerals and trace elements, including iodine and selenium, that are typically lacking in modern agricultural soil. If my ancestors traditionally ate seaweed, but abandoned the practice in the 19th century, members of my family have been depleting our bodies of minerals for several generations. 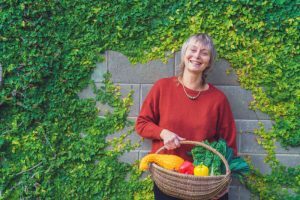 When I wrote an article about about fish oil, clinical herbalist Wendy Illing explained to me that our ancestors would have consumed oily fish regularly – but we don’t eat enough of it in the modern western diet for optimum health. I think the same probably applies to seaweed. Pia Winberg thinks the seaweed-nutrition connection is more complex than just boosting our nutrients. She says the fibre in seaweed interacts with our gut flora and improves all sorts of chronic health conditions. Herbalists in general are very much in favour of seaweed. Susun Weed devotes a whole chapter to seaweed in her book Healing Wise (Ash Tree Publications, 2003) on seaweed. She says almost all varieties of seaweed are edible. The main one that isn’t is Lyngbya, or Mermaid’s Hair, which has slimy green hair-like strands. I don’t think it grows in New Zealand waters. American herbalist Rosalee de la Foret has some creative seaweed recipes, including seaweed cookies! Above: seaweed, local and non-local. Top left: Japanese-style nori snack; top right: Chinese dried karengo. At bottom, from left: New Zealand-sourced kombu, bladderwrack and wakame. Interestingly, Sally Fallon, author of nutritional recipe book Nourishing Traditions, isn’t keen on seaweed. She cautions that it’s easy to overdose on seaweed (but doesn’t give any research references to back this up). Sally Fallon also says Asian-harvested seaweed may be contaminated with pesticides and/or fungicides. (Again, she doesn’t give a reference for this.) I’m interested in finding out more about this. We’re a small island nation and seaweed grows in abundance all around our coastline. You can gather seaweed for personal use, but it’s difficult to get a permit to collect it commercially. There’s lots of potential for seaweed aquaculture. The two classic books on foraging in New Zealand are Gwen Skinner’s Simply Living; A Gatherer’s Guide to New Zealand’s Fields, Forests and Shores (A.W. & A.H. Reed, 1981), and Johanna Knox’s A Forager’s Treasury (Allen & Unwin, 2013). They both have plenty to say about seaweed. Johanna suggests gathering what’s been thrown up on the beach after a storm, as I did at Matangi. Seaweed is a traditional food for Maori, and in some regions local iwi harvest it in large quantities. Napier-based chef Gretta Carney said in a recent National Radio interview that karengo is harvested in Hawke’s Bay in August and September and hung to dry on fences. It’s a seasonal crop – most of the year it’s just tiny stubble on rocks. She strongly recommended checking with local iwi about where it is okay to gather seaweed. Not everyone appreciates seaweed. Councils and property owners think it’s a big nuisance when it turns up in large quantities on their beautiful white sand beaches. In the Bay of Plenty the council spends lots of money and effort getting rid of sea lettuce (Ulva latuca, and perfectly edible when it’s not in the wrong place) when it drifts onto beaches and starts rotting. Recently there was a big seaweed dump on Auckland’s Takapuna Beach. One of my favourite New Zealand companies, Paeroa-based company Agrisea, has built a booming business by transforming New Zealand seaweed into hugely valuable fertilizers for all aspects of agriculture and horticulture. They also have a range for home gardeners. Seaweed fertilizers such as Agrisea’s don’t just boost the nutrients in our food supply, they improve the soil structure so the land is more resistant to drought. And seaweed may have other benefits for agriculture. Australian-based scientist Rob Kinley is researching feeding seaweed to livestock to reduce methane production. Above: seaweed from the supermarket. Belarussian pickled kelp, left, and Korean pickled seaweed of unspecified variety. Village Organics in Frankton have a good range of dried seaweed products, including some from New Zealand. Most mainstream supermarkets sell nori seaweed for sushi, and often packets of toasted seaweed snacks. My local New World also has trays of Korean-style seaweed salad (suspiciously bright green) and packets of northern European seaweed salad (with lots of preservatives and additives listed), in the chiller near the fish counter. Seaweed isn’t actually a plant, it’s algae. There are red, green and brown varieties, but seaweed mostly looks brown when it’s dried. Here are some the kinds that I have come across. Kombu or kelp: in New Zealand the main kinds are bladder kelp, Macrocystis pyrifera and bull kelp, Durvillea antarctica. Kelp often comes dried, in large pieces. Here’s a link to herbalist Rosalee de la Foret’s recipe for pickled fresh kelp. Dried kelp is also flaked and combined with salt for a nutritional condiment, e.g. Malcolm Harker’s Sea Salt with Sea Kelp. Sally Carson says kelp chips are delicious, but I haven’t tried this. I also have a packet of dried wakame, Japanese kelp, Undaria, from Stewart Island. It just needs a few minutes in warm water before being used for a salad. Or it can be added “as is” to a stir-fry. 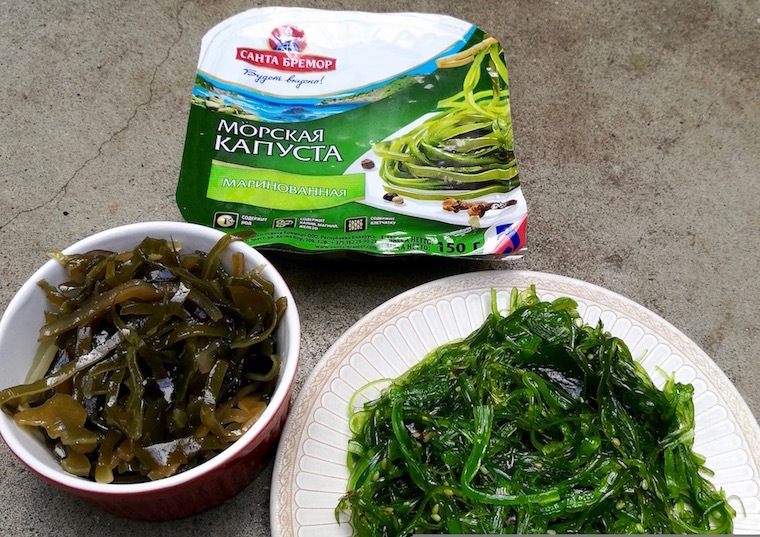 The seaweed salad from Belarus that I found in the supermarket is Laminaria, which is another kind of kelp. Karengo (Maori), nori (Japanese) and laver (Welsh), are all similar kinds of seaweed, various Porphyra species. This is the purple frilly seaweed that grows on rocks at the high tide mark. In Hamilton, Village Organics sell bags of dried karengo fronds. In Japanese and Korean cuisine it is processed into thin sheets for rolling sushi, or toasted as snack food. I’ve found big disc-shaped packets of this kind of seaweed in Asian supermarkets for incredibly cheap prices. Other kinds of seaweed that are found on the New Zealand coastline are bladder weeds, Cystophora species – Gwen Skinner recommends eating the tips – and Venus’s necklace, Hormosira banksii, which looks like a string of beads. Gwen says it is “particularly palatable when eaten raw”. Other kinds of dried seaweed include dulse, which is a north Atlantic seaweed, and hijiki, which is a kind of seaweed that grows in Japan. I’ve enjoyed it in the past, but not as much Japanese seaweed is imported to New Zealand since the Fukushima nuclear power plant disaster. It’s best to use fresh seaweed the same day you gather it. It doesn’t keep – even after 24 hours it will start smelling funny. Fresh seaweed can be pickled. It’s also quick and easy to dry seaweed in an oven or dehydrator on low heat. This is my invention. There’s no mention of seaweed in my Scandinavian recipe books. It’s not dissimilar to the Belarussian pickled seaweed that I found in the supermarket (but, I think, much nicer). Rinse a handful of fresh seaweed (mine was a mix of brown kelp, green sea lettuce and a bit of purple karengo), and slice finely into strips. Combine with half a cup of thinly sliced cucumber, half a cup of sliced red capsicum, and a few thin slices of red onion. Make a dressing of equal parts of olive oil and lemon juice, and sprinkle this over the salad. Add freshly ground black pepper and a small amount of sea salt – check the flavour balance. This salad is a condiment or antipasto dish rather than a main meal salad. A small amount goes well with other European-style foods: smoked fish, sourdough bread, sliced tomatoes, gouda cheese. Boil dried karengo in water for about an hour until it is a green mush, like overcooked spinach. Cool and mix with oatmeal. I used 1 cup of cooked seaweed and half a cup of oatmeal. Shape into little cakes, coat in more oatmeal and fry in lard until brown, turning over once. NB the Welsh cookbook suggests adding cockles to the cakes, if you have some. Serve two or three laverbread cakes per person with fried bacon and eggs and slices of fried black pudding. (I recommend the black pudding made by Jonathan from Soggy Bottom Holdings at the farmers’ market .) Sprinkle finely chopped parsley and black pepper to serve. Follow this up with toast and marmalade and a cup of hot tea with milk. This is a delicious addition to stir-fried vegetables or fried rice. Toast dried karengo in a cast-iron frying pan until it’s crumbly in texture. Mix with an equal proportion of toasted sesame seeds. Sprinkle a couple of tablespoons over Asian-style dishes just before serving. To prepare fresh karengo, boil or steam in a little water with a good dollop of butter for 20-30 minutes. To prepare dried karengo, pour over boiling water and boil for about an hour with a good dollop of butter. This is pretty similar to the Welsh laverbread recipe.